The practice specializes in landscape architectural, planning and design services. Our portfolio includes a diverse set of skills and a range of services from initial conceptualisation through to implementation and the management of landscape projects. We pride ourselves in our ability to bridge the gaps between engineering science, environments and people through an informed approach. Being experienced in environmental, social and cultural systems, we are uniquely positioned to bring related professions together into new alliances to address complex social and ecological problems. We bring artistic form and integrated function to the ideals of community, sustainability and resilience. As a core focus area our Landscape Architecture projects encompass a diverse range of projects from the regional to the local scale, from straightforward to complex, always striving for new innovative solutions through critical analyses. The landscape design approach is contextual, drawing on the landscape, culminating in a product of culture, topography, vegetation, climate and ecological processes. From a landscape perspective we aimed to emulate the natural vegetative response to climatic cycles, which resulted in seasonal variation and reduced maintenance, thereby ensuring a sustainable project. The landscape forms a series of interconnected outdoor rooms that complement existing buildings and answer to the needs of users. The landscape responds to functional aspects of the site and the users. The design seeks to create human-scale therapeutic spaces that contribute to the healing processes that are fundamental to medical institutions. The design replicates and re-establishes ecological systems to increase biodiversity through habitat creation. Such an approach moreover promotes sustainability in terms of implementation and long-term maintenance. The design approach for Lehae Park focused on the development of a vibrant community park that promotes the integration of the local community— inclusive of children and adults—around a common need for recreational space. The sustainability of the park hinged on the incorporation of robust play elements with drought-resistant and frost-hardy plants. The development of the park centres on a central playground, of which the concept aims to inform users of the fact that, just as in nature, people are connected and dependent on others. 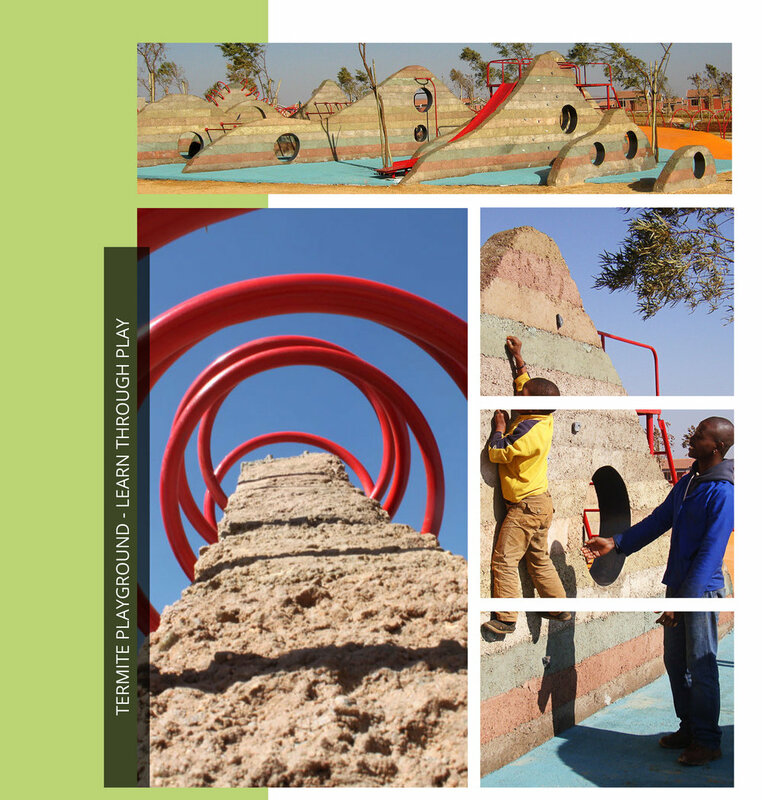 The playground was developed with a narrative that involves the dynamics within and around a termite mound (present on site). This was translated into the design elements of the playground. The play equipment is associated with a sequence of freestanding perforated walls that form an interconnected playing space. Murray Park is a public resort next to the Alexander Dam in Springs, Benoni. The Ekurhuleni Metropolitan Municipality is in the process of renovating the resort over several financial years. The park was completely derelict, and run down. This brownfield site provided distinctive opportunities such as changing a dilapidated pool into a skate park. An existing 1960 Googie-style roof structure in the park inspired the Space Age theme for the park. A strong emphasis was placed on inclusive design, with playgrounds, ablutions and other amenities catering for individuals with different disabilities. We focus on bringing a unique factor to each park development, making extensive use of custom-designed products. We work closely with engineers and manufacturers to ensure that all designs comply with the SANS 511761:2010 playground safety standards. 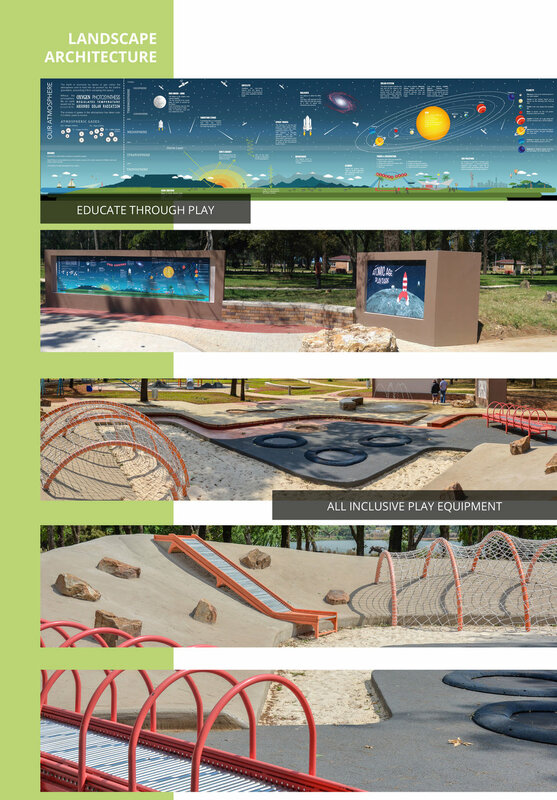 A special emphasis has been placed on natural playground elements and how playing with sand, water and objects are greatly beneficial to the cognitive and emotional development of children.